Micro-influencers have niche social followings. The interest in influencer marketing has been growing steadily over the past few years and more people are seeking to understand more about it now than ever before. How to do I discover the right influencers? What’s the best way to reach out to influencers? Here’s a step-by-step guide to help you run a social media influencer marketing campaign. 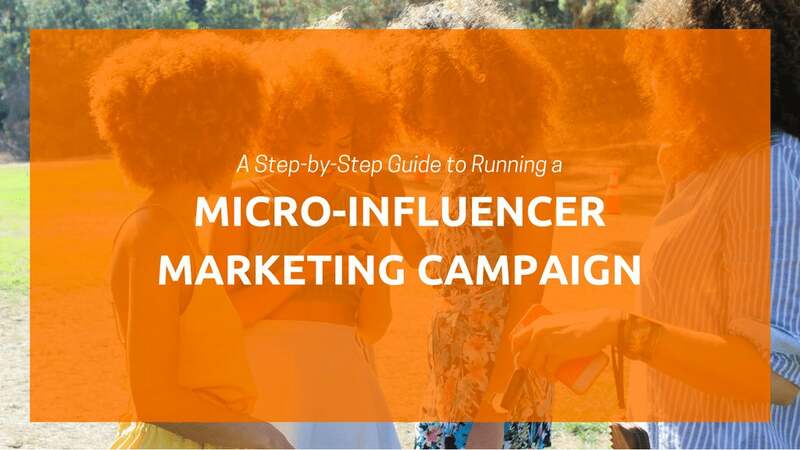 In this guide, we’ll focus on only micro-influencers -- influencers with a niche engaged following. To illustrate how micro-influencer marketing works, here’s an example I found on Instagram where @amandafrederickson collaborated with Thermomix. The first step is to set your goals and the metrics you’ll use to measure success. Your goals will affect which influencers you work with and how you collaborate with them. And your selected metrics will help you assess the success of your campaign at the end of it. Brand awareness: Reach of the campaign, growth in social media following, number of social media mentions, etc. Increased sales: Growth in sales, amount of sales through a designated coupon code for the influencer, etc. Engagement and customer retention: Engagement generated during the campaign, number of repeat customers during the campaign, etc. Once you have selected your metrics, record the current stats just before the start of your campaign. You’ll compare them with the stats at the end of your campaign. The next step of your planning phase is to decide where you want to run your social media influencer marketing campaign. 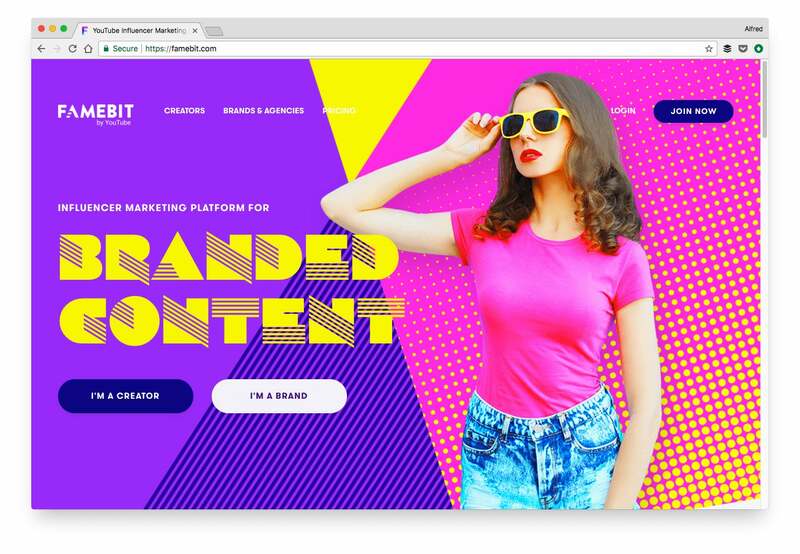 Each platform has its unique style, audience and works well for different objectives. Target audience: Pick the platform where your audience is. For example, if you want to reach teenagers or young adults, you might want to go with Snapchat. Visual or text content: If you want the micro-influencer to post a photo, you might want to go with Instagram or Pinterest. For videos, maybe YouTube or Facebook. For text, maybe LinkedIn. You might also want to check out less-known and less-popular social media platforms as well. For example, musical.ly, a platform for creating and sharing short videos, has become very popular among teens. Other platforms you can check out include Anchor, Medium and Tumblr. 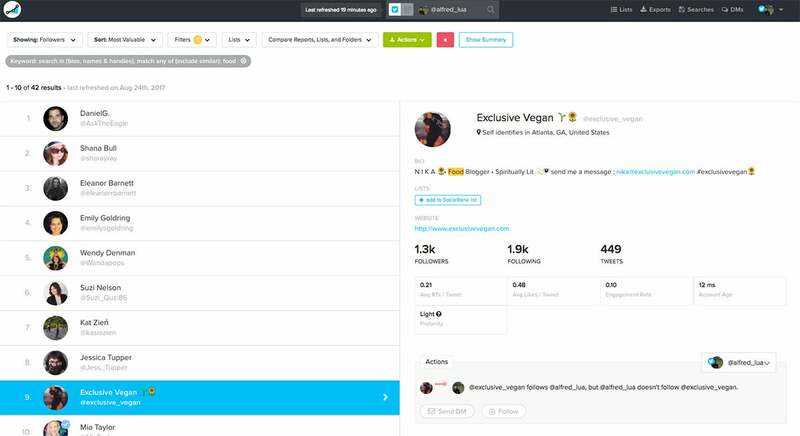 As this is a key step for running an influencer marketing campaign, this section is a little more detailed than the rest to help you find the best micro-influencers for your campaign. There are several ways to find suitable micro-influencers, depending on the amount of time and money you want to spend. The most affordable way is to research manually on each social media platform. The major social media platforms all allow you to search for profiles. The best way to research users is to enter the keyword for your campaign such as “food” or “fitness” and use the filters to narrow down the search results. For Facebook, you might want to only look at “Pages”. 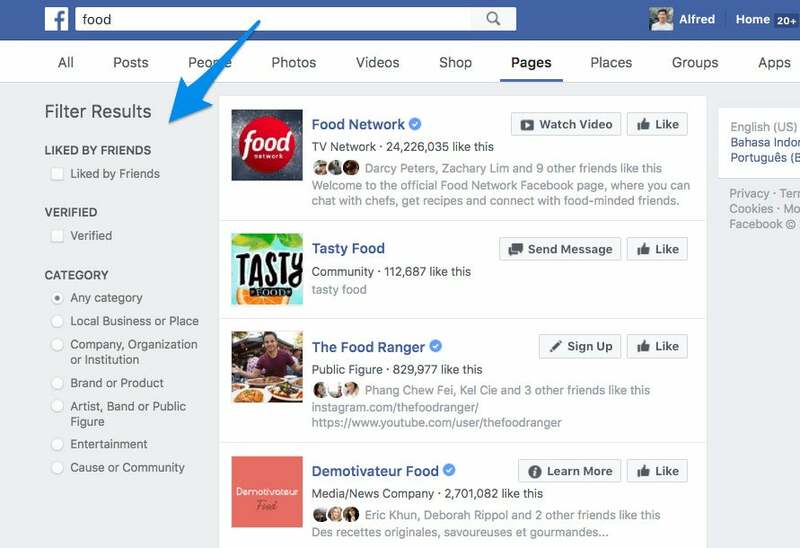 You can filter the results by category, if your friends have liked the Page, or if the Page is verified. For Twitter, you would want to select the “People” tab. You can reduce the results further by selecting “People you follow” and “Near you” if you are looking for a micro-influencer near you. 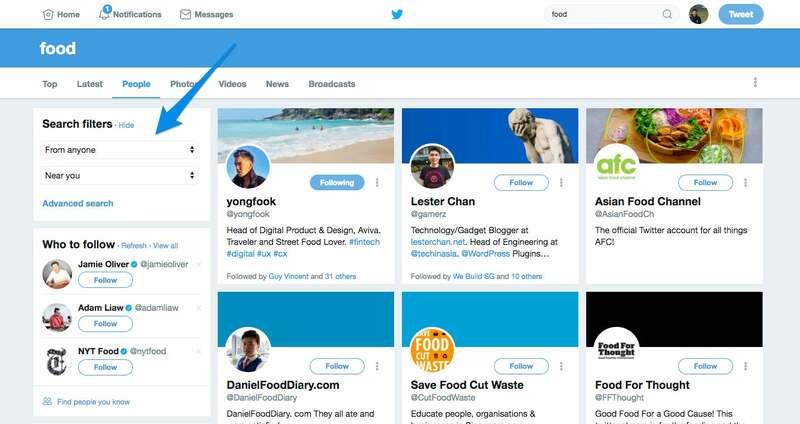 Here are more tips on using Twitter’s Advanced Search feature. 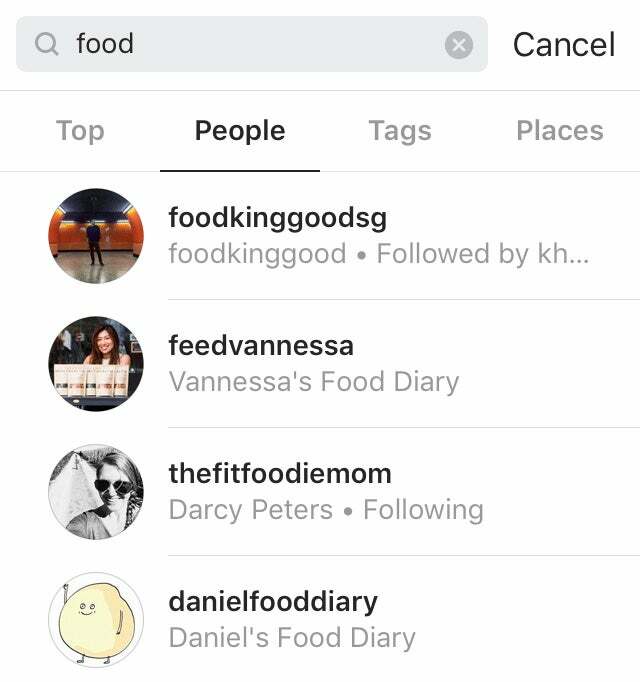 For Instagram, you can search for “People," “Tags” or “Places”. Here’s more information on the five ways to use Instagram Search to find Instagram influencers. For YouTube, the best method seems to be searching on Google. 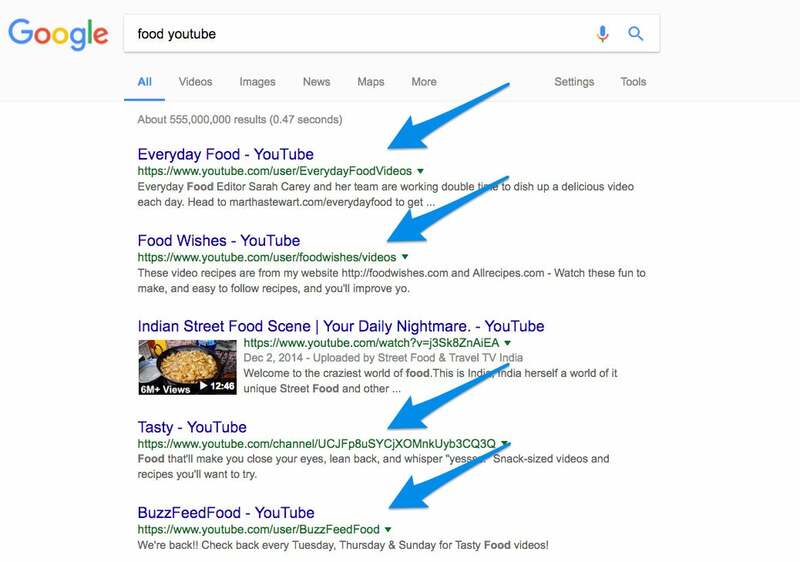 You can search for “(your keyword) youtube” such as “food youtube," and Google will bring up YouTube channels related to your keyword. The next step is to manually look through the profiles and take note of those that might be suitable for your influencer marketing campaign. A quick tip is to keep an eye out for relevant keywords in the username or handle. Often, micro-influencers would include their niche in their username or handle such as @kellybakes. Sometimes, the micro-influencer you’re looking for might already be following your brand on social media. 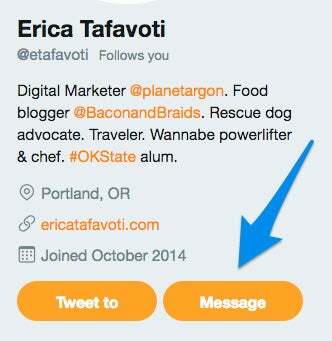 You could manually go through your follower list or use a tool like Social Rank to help you. You can also look for clues on their profile, such as their handle, username, bio or posts, to see if they belong to the niche you want to reach. Apart from speeding up the search process, another advantage of this approach is that the micro-influencer might already be a fan of your brand and would more likely agree to a collaboration. This approach might cost a little but can save you some time and could bring you better results. In general, most platforms are self-serve, while most agencies would have someone to help you with the search and collaboration. These platforms and agencies often keep a record of the past collaborations and reviews of the influencers, which can help you make better decisions. As for influencer marketing agencies, here are the eight that Influencer Marketing Hub recommends. If you run a local business, you might also want to search on Google for agencies that are based in your area. They might have the best relationships with the influencers in your area. 1. Is their content in line with your brand or campaign message? I believe this is the most important consideration since the micro-influencers would be promoting your brand. Just like brand ambassadors, the way the micro-influencers portray themselves will say something about your brand. 2. How many followers do they have? The best follower size depends on the budget you have for the campaign. Influencers with more followers tend to ask for higher compensation. From their analysis of more than 800,000 Instagram users with at least 1,000 followers, Markerly recommends working with influencers in the 10,000 to 100,000 follower range. They believe those influencers “offer the best combination of engagement and broad reach, with like and comment rates that exceed influencers with higher followers”. 3. Do you think they are influential in your niche? You can find clues on their profile. Do they post about your niche regularly? Do their followers like what they post? Do their followers praise their recommendations? 4. How engaged are the followers? To check how engaged their followers are, you can scroll through their recent posts and look at the comments on each post. 5. Do they post regularly? Similarly, you can look at the recent posts and see when they were posted. You would want someone who posts and interacts with their followers regularly. 6. Have they done collaborations with other companies before? While this isn’t always necessary, it can be easier to work with experienced micro-influencers. They can likely create better content, too. Also, it might be nice to check if they have partnered with any of your competitors before. Once you’ve found some potential micro-influencers, next you need to reach out to them. The most traditional method is to email anyone you’re looking to work with. Most of the time, if they link to their website from their social media profile, you can check if they have their email address on their website. Some will also list their email address in their profile description. 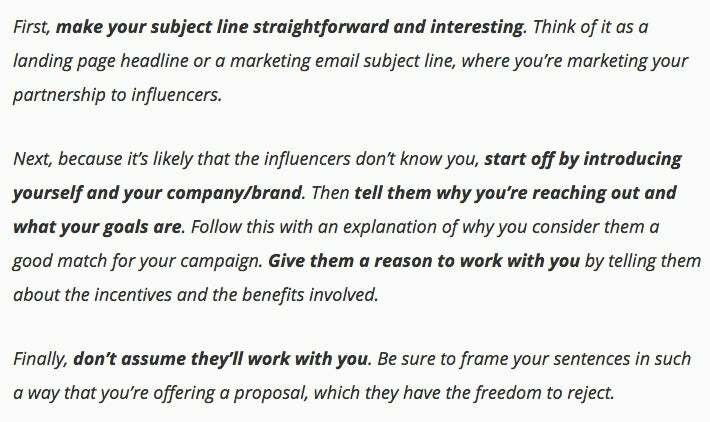 Even if you are using an influencer marketing platform or hired an agency, you’ll likely still need to send an offer email. Honesty: I mentioned that I just found their account, check it out, and love it. If I had been following them for a while, then I would mention that. 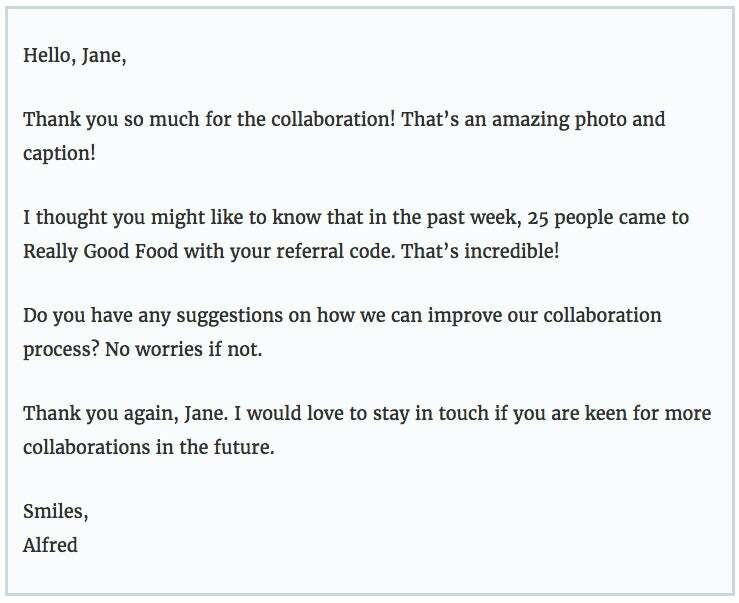 Offer: I briefly stated the offer so that the micro-influencers can make an initial assessment of the collaboration. Compensation: While some micro-influencers are open to promote your product in exchange for a free product, it’s great to show you’re open to paying for posts and enquire about the rates they charge. Exit: Personally, I like to leave an easier “out” so that the micro-influencers wouldn’t feel bad saying no. This can help to maintain a good relationship in case they are interested in collaborating in the future. I have a hunch most people check their DMs more than their emails. This makes it a great channel for outreach. For Facebook, some Facebook Pages allow you to message them. For Twitter, some influencers will allow anyone to DM them. If you see the “Message” button under their bio, it means that you can DM them even if they don’t follow you. The final method is a little indirect but can be just as effective -- using comments to start a conversation. 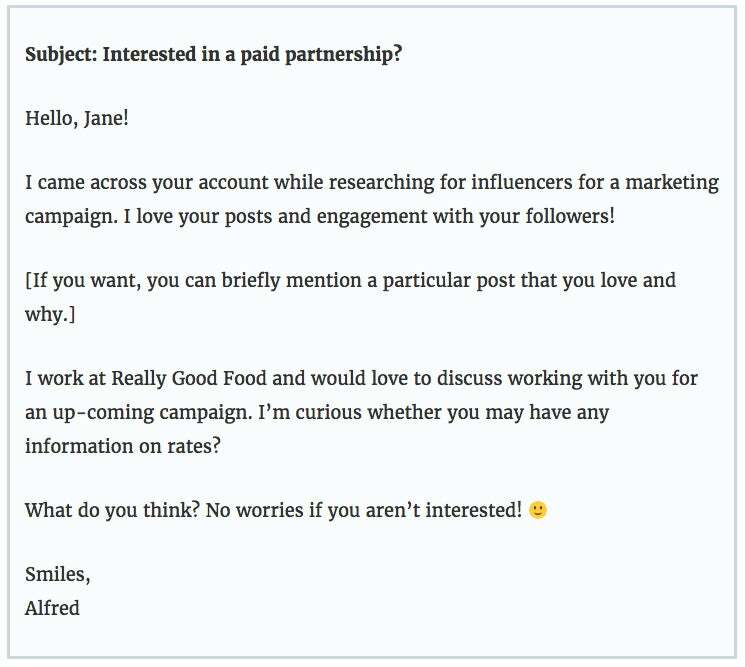 If the micro-influencer is interested, you can then move the conversation into DMs or email. Here’s the fun part: getting your campaign rolling. Now you have your list of influencers who are interested in the campaign, it’s time to fine-tune your partnerships. Letting them know your goals can make it easier for them to craft their posts. It’s often best to let the micro-influencers decide what they want to post as they know their niche and followers best. But as you know your brand and campaign goals better than them, you could let them know your guidelines. Is there anything you wish they would include? Is there anything they should avoid mentioning? Tip: You can look for inspiration by searching for hashtags like #sponsored, #ad, #sponsoredby and #sponsoredpost. This could be in the form of cash, a free product or discounts for their followers. There are several FTC rules to comply with while working with social media influencers. Here’s an article that shares a bit more on this topic. You can also coordinate the date and time of the post if the timing is important for your campaign. Once the campaign is over (great work! ), you would want to measure your success. Here’s where your goals and selected metrics from Step 1 come into play. Take a look at the goals you set before you started the campaign. And then review performance overall and also how each influencer affected your results. How have your metrics changed? Which micro-influencer drove the most sales? Finally, remember to thank the micro-influencers for the collaboration. It could be nice to share your campaign results with them as well. If it has been a success for both parties, they might be keen to do more collaborations in the future.